According to the Canada Green Buildings Council, buildings have significant environmental impacts: They are responsible for up to 35% of all greenhouse gas emissions. 35% of landfill waste comes from construction and demolition activities. They account for 80 per cent of all water consumed. Recognizing the need to minimize these negative impacts, green building standards and practices have been integrated into the planning and design of a number of new buildings and renovations on campus. Over their lifetime, these projects will use less energy and water, generate less pollutants and greenhouse gases, produce less waste and cost less to operate than comparable projects. 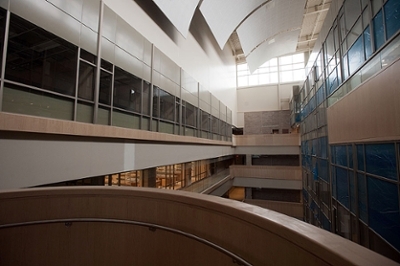 The two additions to the Health Sciences Building were constructed with sustainability in mind. Health Science D-Wing has officially received its LEED Bronze certification. 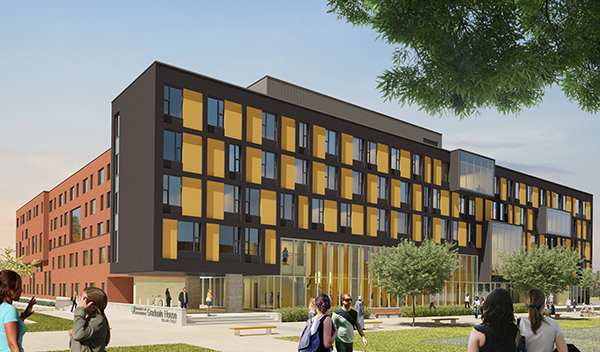 The university hopes this project will receive LEED Gold certification. Construction of the College of Law Addition was completed in 2008 and awarded LEED Gold certification. Among the many green building practices that contributed to that certification were the two living roofs that cover more than have of the addition. The living roof provides insulation for the building and extends the lifespan of the roof. Rainwater falling on the roof is absorbed by the soil which reduces the rate of runoff to stormwater sewers and filters the water, decreasing pollution. The addition also features the use of displacement ventilation, radiant heating and cooling, and 100% outdoor air to help conserve energy while maximizing indoor air quality. The addition was designed for energy- and water-efficiency. Careful management and recycling during the construction reduced the waste going to landfill by 85% of what would normally be generated by a project of this size and nature. The existing concrete floor was hardened and polished, eliminating the need for new floor materials and finishes. Light quality was improved and energy requirements reduced with daylight sensors and dimmable fluorescent ballasts that adjust lighting levels according to the amount of natural light present. 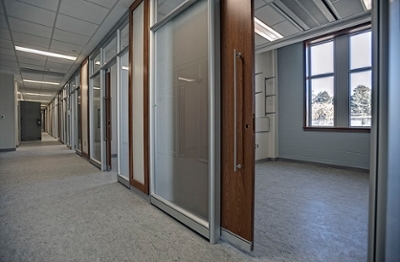 Demountable wall partitions were used in place of drywall and steel studs in office areas, to eliminate the waste associated with future office reconfigurations and allow for flexibility in office layouts. 75% of construction waste was diverted from the landfill. For example, 300 light fixtures were reused in campus retro-fitting programs. Water-saving flush valves on flush toilets and water efficient urinals were installed to reduce water consumption. The Place Riel four-storey expansion project was awarded LEED Silver certification for its design and construction practices. The University of Saskatchewan Students' Union asked the design team to make the project as environmentally sustainable as possible. Some of the green building initiatives used in the design include: an energy efficient mechanical system, building envelope, and lighting; low or zero VOC emitting interior finishes; and renewable and recycled building materials. At least 75% of construction waste was diverted from the landfill. LEED innovation credits were awarded for exemplary performance in water use reduction, recycled content of materials used and sourcing local/regional materials. More on the Place Riel Expansion. 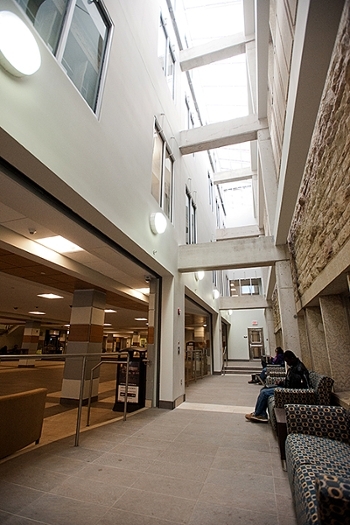 Student residences typically use large quantities of energy and water per resident. With this in mind Graduate House design focused on minimizing the use of both energy and water. It was built with materials which minimize environmental impacts and ensure a healthy indoor environment. A retention pond slows water runoff and limits pollution from stormwater. Spaces were designed to foster a culture and community that supports sustainability. Green cleaning products and practices are used in campus buildings to ensure healthy working conditions for custodial staff, healthy air quality for building occupants and to minimize environmental impacts. All products used to clean the 43 campus buildings maintained by Facilities Management are EcoLogo certified. The cleaning products are non-toxic and low-VOC (volatile organic compounds). In addition to this, all chemicals used by custodial staff are metered. By measuring these chemicals carefully, staff will ensure they are only using the correct ratios. The residence cleaning staff have also switched to green cleaning in nine buildings including the four high-rise residences in McEown Park. Facilities Management's Project Design Manual sets standards for the design and construction of university buildings and grounds. Where relevant it incorporates sustainability-related best practices and standards.